One of the concept motorcycles of TVS Motor's production named 'TVS Akula 310' showcased side by side with his brother 'TVS X21' at the Auto Expo 2016 event in New Delhi, India. The racing style motorcycle was touted produced by using BMW G310R as the base. 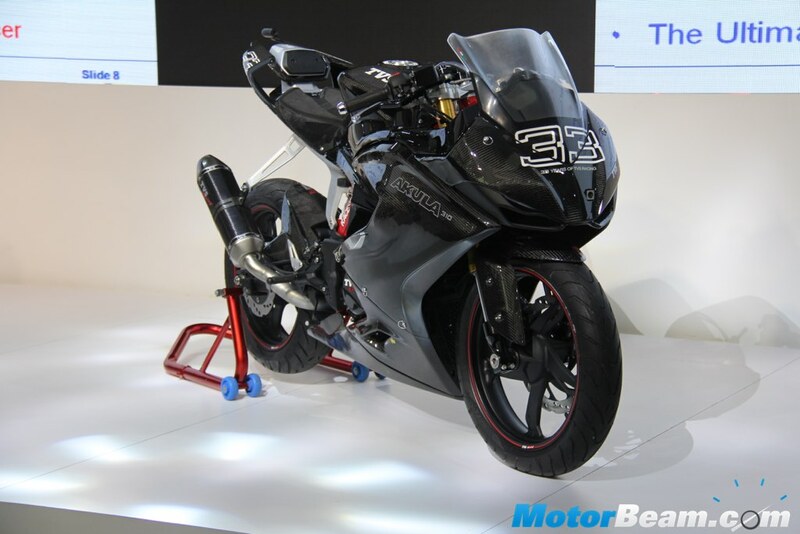 The Akula 310 made by TVS racing team to commemorate 33 years of the company gait in the racing world. The motorcycle was carrying a 310 cc engine, four valve, DOHC, but TVS does not disclose how the power generated. If we seen of the BMW G310R's the power burst, its output reached 34 bhp. In appearance, the Akula 310 design, both from the front, fuel tank and fairing, strongly supports the aerodynamic package. Inspired by the fish, on the underside of the motorbike made "gills" that serves as an air hole to aid the engine cooling. No wonder when the motorbike is called 'Akula' which in Russian means 'shark'. Its engine section is protected with a full fairing, so that the drivetrain is almost invisible. Moreover, to make the motorcycle remains light, the carbon fiber material used for its body. Other sections also use aluminum. By using digital instrument panel that displays the speed, rpm, time, and other information. There is also a gyro-board camera. 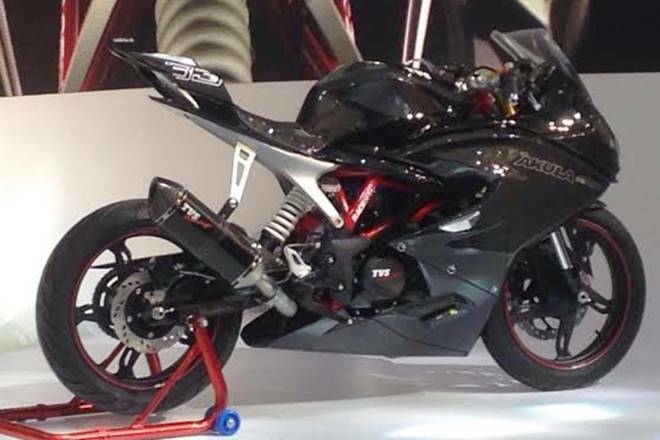 TVS plans to produce the Akula 310, but with a slightly different specification from the concept version. That is by using a 313 cc engine, single cylinder, capable of producing 34 bhp at 9,500 rpm and torque of 28 nm at 7,500 rpm.